Historians believe the last-known photograph of Mary Todd Lincoln was taken around 1872 by William Mumler. This image depicts that photo to which Mumler superimposed a ghostly appearing President Lincoln with his hands on his wife’s shoulders. The story of Abraham Lincoln's assassination wouldn't be complete without examining "the rest of the story." Here are some very interesting facts. About four months after he prevented Anna Surratt from asking President Johnson for clemency, ex-Senator Preston King committed suicide. While on a Hudson River ferry boat, King tied a bag of bullets to his neck and jumped into the water. A few days after the first anniversary of Mary Surratt's execution, the other Senator who prevented last-minute efforts on her behalf took his own life. On July 11, 1866, James Henry Lane shot himself at Ft. Leavenworth, Kansas. Despite the detailed report Lt. Doherty filed after the capture and death of John Wilkes Booth, controversy has continued whether the dead man was really the assassin. Efforts to convince a Court to exhume his body for DNA testing continue. It was alleged on this trial that this house [the Surratt boarding house] was a secret rendevous of those who plotted treason against the Government. If that be granted, still it can be asserted that, in all the pages of the record, of that trial, there can be found no testimony to show that Mrs. Surratt was cognizant of the same, or even participated in a single meeting. The testimony of Weichman - the one whom she had nurtured as a son, and who falsely swore her life away to save his own - nowhere reveals the fact that she ever participated in any plot, or was privy to the knowledge that in her house were planned the abduction and final assassination of that great man whose heart beat only with kindness and sympathy for all. Mary Todd Lincoln (who reportedly had a sharp tongue and a sometimes-strained marriage) had to petition the Congress for a pension after her husband's death. She also endured a competency trial wherein a jury found she should spend time in a mental institution. She eventually got out but died a recluse. She never returned to the Lincoln family home in Springfield - the only house the President ever personally owned. 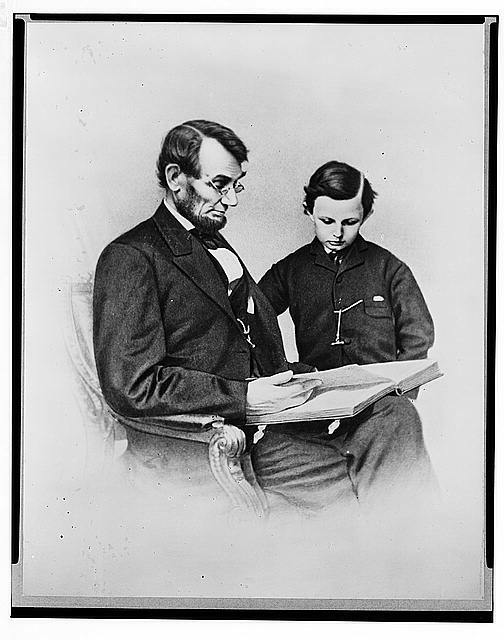 Tad Lincoln, who was photographed with his father on February 9, 1864, survived his dad by six years. The President's youngest child was only 18 years old when he died in 1871. The Lincolns lost two sons during the President's life: Eddie, who died before he was four, and Willie, who died during the White House years. The President was distraught over losing fun-loving, mischevous Willie: "My poor boy. He was too good for this earth. God has called him home. I know that he is much better off in heaven, but then we loved him so. It is hard, hard to have him die!" The President died in the home of William Petersen. Six years after the assassination, Petersen's laudanum-filled body was found on the Smithsonian grounds. He had committed suicide. Henry Reed Rathbone, the man who fought with Booth after the shooting, married his fiancé, Clara Harris. But just before Christmas, in 1883, Rathbone took a knife and a pistol and tried to kill his children and himself. He succeeded in killing Clara. Years later, Rathbone's son - Henry Riggs Rathbone - told the story of Abraham Lincoln's Last Day. Although little was previously known about Abraham Lincoln's private life, the oral history of his African-American housekeeper, Mariah Vance, has recently been published. The book provides tremendous insights into Lincoln's Unknown Private Life. In September, 1901, Mr. Lincoln's reconstructed tomb in Springfield, Illinois was ready. Robert Todd Lincoln, his son, wanted to be sure that no thieves would ever again attempt to steal his father's body. The reburial would be permanent since the coffin would be buried in concrete. Rumors had persisted that Mr. Lincoln's body wasn't really in his tomb. It was decided to open the coffin on September 26, 1901. Twenty-three people were present, including a young teenage boy named Fleetwood Lindley. Each person looked at the body of the dead President (whose face was "chalky white"). Although 36 years had passed, Mr. Lincoln's remains had not deteriorated. Bos, Carole "THE REST OF THE STORY" AwesomeStories.com. Mar 01, 2002. Apr 23, 2019. What Unexpected Events Followed the Death of President Lincoln?